Neuropathy secondary to drugs is a loss of sensation or movement in a part of the body due to nerve damage from taking a certain medicine. A splint is a device used for holding a part of the body stable to decrease pain and prevent further injury. 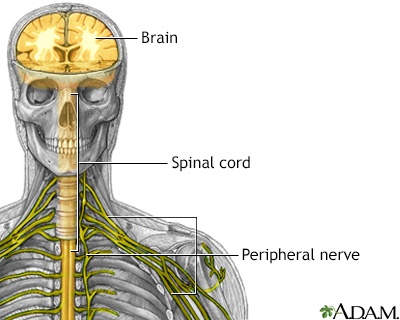 A nerve biopsy is the removal of a small piece of a nerve for examination. Peripheral Neuropathy is not a distinct disease, but the manifestation of many conditions that damage the peripheral nerves (nervous tissue other than the brain and spinal cord). Symptoms depend on whether sensory nerves (the nerves that transmit sensory information from the body to the brain and spinal cord) or motor nerves (the nerves that transmit impulses from the brain and spinal cord to the body) are affected. If the sensory nerves are damaged, sensation may be diminished, lacking or abnormal. Damaged motor nerves impair movement or function. 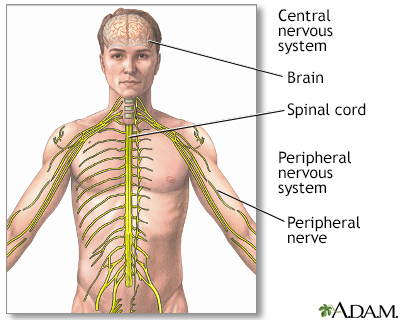 Peripheral neuropathy may be caused by direct or indirect injury, or by a systemic cause such as a metabolic disorder.